When a solar company analyzes a residence for rooftop solar, they look at several items, including available unobstructed space (that is free from shade), electric bill usage, and size of budget. What is meant by overbuilding a rooftop solar array is to build out more panels than would be needed to address the home’s current electricity demand. Full use of primary roof. Credit: No license with commercial use allowed per Google images. First, there are a couple of points worth discussing before diving into the enumerated list. The first is an obvious potential limitation regarding this plan, and that is whether or not there is enough usable space on the rooftop for additional panels. If there isn’t un-shaded available rooftop real estate, then overbuilding rooftop solar becomes a moot point. The second consideration is whether or not the homeowner(s) can afford to overbuild their solar project. It may not be that difficult to overbuild, though, since the added solar panels will have a reduced cost per panel relative to the panels in the primary solar array footprint, due to reduced relative soft costs (more on that later). This leads us to consider the reasons to overbuild, and whether or not they are compelling enough for such an investment. Here are some points for consideration. Everyone is likely to rate the value of each point differently depending upon one’s point of view, and it’s possible that not all points will apply to everyone. 1. Increased demand for core home functions that require electricity. Core home functioning is moving away from fossil fuels and toward electricity use. We are seeing more “smart home” connected controls for the thermostat, security, light control, keypad locks, refrigerators, and more. Many of us believe that all of HVAC in homes is moving in the direction of electrical systems. For example, when solar air heaters are installed on the sun-facing side of the home, electricity-using fans are used to move air, and when solar hot water systems are installed, electricity is needed for water pumps. Overbuilding solar arrays leaves capacity available to accommodate these converted home services. Deploying expanded electricity capacity makes sense in this increasingly electrified world. You may have need now or in the future to add one or more EV vehicle charging stations. Odds should be increasing in the coming years that any overnight house guest who drives to your home may be driving an EV that needs a charge. Overbuilding solar leaves room for EV expansion and accommodation. 3. Environmental benefits include overall reduced GHGs produced when rooftop solar increases output. The theory here in this point is that a larger solar array will benefit the environment more than a smaller rooftop solar array. One expanded home solar array will obviously not change the world, but if more and more people do this, then in aggregate it will to some extent contribute in the right direction by displacing fossil fuels. One clear benefit in the migration from burning fossil fuels to increasing renewables electricity production is the retardation of climate disruption due to fewer GHGs (greenhouse gases) being emitted. As more solar electricity is produced, gas and/or coal plants are used less and ultimately, in time, taken offline faster as we migrate to a clean energy world. 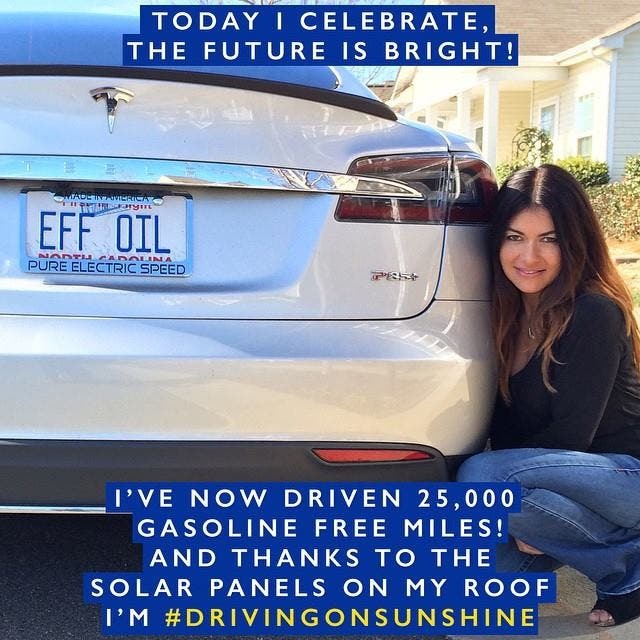 The environmental benefits of solar is a well-discussed topic on CleanTechnica. If you have interest in learning more, please visit “Going Solar Simplest & Biggest Action Anyone Can Make, Says SolarCity” by Joshua S. Hill. 4. More localized solar decentralizes the production of energy. 5. Installing more solar panels helps the solar power industry. Whenever energy-related purchases can be diverted from the fossil fuels industry and directed to the solar power (or any renewable energy) industry, this helps with new R&D funds, more clean jobs, and further reduced costs for renewables due to increased production volume. It’s a well-known fact that solar increases a home’s value when it comes time to sell the home. According to the Lawrence Berkeley National Laboratory (Berkeley Lab), as reported in an article on Fool.com (run by The Motley Fool guys), it is claimed that rooftop solar can increase a home’s resale value by about $15,000. By comparing the sale prices of around 4,000 solar rooftop homes across 8 states and 12 years to nearly 19,000 comparable non-solar homes, researchers found that, for an average 3.6kW solar system house, buyers were generally willing to pay around $15,000 more than for a comparable non-solar home. This means that, to a large extent, overbuilding solar would have to be a labor of love and for motives that consider the big picture, and that aren’t strictly related to financial return. 7. If you have a storage system, it makes even more sense to overbuild. Especially if you have a Powerwall or other storage system, overbuilding your rooftop solar could effectively make your electricity production and use self sufficient. The combination of overproduction and storage can provide you with flexibility to bring you effectively offgrid while still being connected to the grid. The combination of solar and storage would allow you to at least not lose energy that you produce that you may otherwise be providing back to the grid for no compensation (depending upon your utility’s net metering policy). Overbuilding prepares you for the possibility that your utility could have a favorable-to-consumer net metering policy in place at the time of solar installation that may be withdrawn later by the utility. 8. Overbuilding rooftop solar projects may reduce the likelihood of new dirty coal and/or nat gas plants being built. Overbuilt rooftop solar, if done by enough people, would likely contribute by some modicum amount to reducing the need for new dirty coal or nat gas plants to be built as your utility’s electricity demand increases over time. This increase in demand could potentially be satisfied by this extra solar electricity production if enough people did it. All renewable energy production contributes favorably to the global ecosystem to some degree by reducing electricity production from dirty fossil fuel energy or nuclear energy. 9. The soft costs for a normal-sized project are fixed, so increasing the number of panels has only a very slight impact on the project’s soft costs. 10. Overbuilding rooftop solar anticipates more new electricity-sucking devices. New, fun gadgets are being developed every year that either use electricity directly or that use batteries, which require electricity to recharge those batteries. For example, how can we live without Samsung’s smart refrigerator announced this year here in Las Vegas at CES that notifies the user that some food item’s expiration date is about to go bad in the refrigerator? (To be fair to other manufacturers, this idea isn’t brand new.) Indeed, we are seeing more and more devices with no end in sight. A variant concept is to get more efficient panels (if the project isn’t already using the best panels) that would theoretically generate a relative increased gain; ideally, one would both get more efficient panels and more solar panels. Overall, if your rooftop solar project size can be increased, there will be a number of sure benefits, and other possible benefits. The increased array size has long-term benefits, but of course must be affordable for the buyers. Go big. If you work in solar sales and wish to reprint this article for customers, you have permission to do so. If you increase your project size due to this article, or if you work in solar sales and use it, please feel free to write a comment below the article even if the comment comes long after this article is published. I’ll see your comment and reply.